All of our neighbors have legalized recreational cannabis to some degree. What does that mean for the Granite State? Both those for and against legal weed weigh in on the topic. One cannabis advocate calls New Hampshire “an island of prohibition in a sea of legalization.” To others, we’re a pocket of sanity in a world of reefer madness. Most people are still just trying to figure it all out, so we’ve invited local folks with strong positions to roll them up and pass them along. Over the past few years, the road to recreational marijuana has been smooth sailing for northern New Englanders (and our Canadian friends). For curious Granite Staters here in the Live Free But Don’t Try It State, here’s a guide to how our neighbors’ laws are shaping up. Not only is our state surrounded by places where weed is legal, each of us is surrounded by people who have made their decisions on the substance, pro or con, and their convictions affect their lives in a variety of ways. Here are a few of those people and their opinions. In 2018, Vermont became the first state to allow the possession, cultivation and recreational consumption of marijuana through a state legislature. Adults (21+) are permitted to possess up to one ounce of cannabis, two mature and four immature plants. Lawbreakers face fines up to $500 and jail time. It’s OK to use it in homes or rented apartments, with landowner’s permission, and outside, but not in public or within view. If you cultivate two mature plants that produce over one ounce of marijuana, Act 86 states that you’re legally allowed to keep whatever you harvest, as long as it’s kept in a secure place where it was grown. However, Act 86 deals with the possession of marijuana, not the sale. If you are caught selling, you are subject to prison time and a fine up to $10,000. Crossing state lines is a federal offense, and driving under the influence holds the same standards as a DUI. There are two recently opened recreational dispensaries in Leicester and Northampton, where those 21 years or older can purchase up to one ounce of marijuana. They can keep 10 ounces inside of their residence, while cultivating up to six plants with a maximum of 12 per household. Although legal to consume, usage is confined to that of private residences. Massachusetts doesn’t require a minimum amount to be in your system to prove impairment, so any consumption can result in an DUI. Adults can carry around up to one ounce of cannabis, though exporting remains illegal. Since November of 2016, recreational use of marijuana has been legal all across the Pine Tree State. Adults (21+) can legally possess and farm up to two and half ounces of marijuana, six flowering plants and 12 immature plants. Users will be able to purchase up to the legal amount at recreational dispensaries, and it can be consumed and cultivated on private property and out of view. Lawbreakers face a civil violation with a fine of up to $100. Driving under the influence will result in a DUI. Although transporting is legal, exporting cannabis is not. Though subject to provincial and territorial restrictions and guidelines, adults (18+) are within their rights to possess up to one ounce of marijuana in public. Selling is illegal, but sharing up to one ounce with other adults is permissible, and purchasing from a licensed retailer is allowed. For territories without licensed retailers, cannabis can be purchased online from federally licensed producers. In most provinces, adults are allowed to possess four flowering plants per household and are able to travel with cannabis from province to province. Consumers are even permitted to travel while flying internationally carrying one ounce. Possession over the limit could result anywhere from a ticket to 5 years in jail and exporting internationally can result in a sentence of up to 14 years. We asked the Twitterverse to chime in for this story and for folks to give us their best 280 characters (the Twitter limit) on legalization in New Hampshire under the hashtag above. The conversation is still going on, so feel free to tweet for yourself. New Hampshire authorized medical marijuana in 2013 and in 2017 decriminalized the substance for adults (18+). Punishable by a $100 fine for the first two offenses, possession of three-quarters of an ounce has been reduced to a civil violation. Operating a vehicle under the influence is prohibited and transporting a Schedule 1 substance (which weed still is) across a state border is a federal crime. Although decriminalization keeps local users out of jail, it’s safe to assume there is now a watchful eye on those passing in and out of state to get their hands on legal cannabis. During a trip to my mom’s doctor trying to deal with her pain level, he brought up the “suggestion.” Her doctor stated, “Up until a month ago I would never have thought of suggesting this, but another patient of mine has had wonderful results. Have you considered medical marijuana?” To that my 90-year-old mother replied, “If it works, give me the wacky weed!” So starts the adventure to become my mom’s “connection.” Just to be clear, I’m not growing the stuff in the woods of New Boston. I just knew I needed to help. 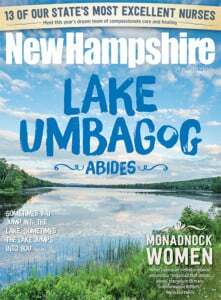 Seven years ago, New Hampshire Magazine explored this same topic with a cover story that featured a big cannabis question mark. That same mark today might look more like a cloud of smoke as 420 revelers exhale a premature victory toke. So will NH legalize recreational cannabis in the coming year? The answer, as one poet famously sang, is blowin’ in the wind. Mom lives in Massachusetts where medical marijuana is legal. First step was to reach out to a medical facility that specializes in medical marijuana. The office looked like a cross between a former yoga studio and a college dorm. The staff was nice and very willing to help. Their doctor even offered to go out to my car to meet and interview my mom. Mom, the nonagenarian, sat in my little 5-speed, wearing wraparound dark sunglasses, looking like an extra from “Breaking Bad.” The doctor said $200 and she could apply for her medical marijuana card through the state of Massachusetts. With that card you can buy from a dispensary. I just had to go online to enter her information and scan in her ID with a picture. Three weeks later, she was turned down by the state because her driver’s license has expired. “She’s 90, can’t see over the dashboard, uses a walker because her knees don’t work, and is in a ton of pain!” I explained to the less-than-caring state worker. “She needs a valid ID. Rules are rules” was her retort. OK, this was going to take longer than expected, and I needed to act. My mom is a strong-willed woman and the last thing I wanted to do was let her down when she yells, “Where are the goofy drugs?” Plus, I’m still afraid of her. I know a guy. So, I made a call. Got some product and did what every good son would do. I Googled it. “How to make a cannabis salve?” I found a couple of YouTube videos and did my research. I learned about “shake” (ground-up weed you bake at a low temperature), CBD (makes you sleepy and helps with anxiety) and THC. OK, I knew about THC. That’s the part that got me high before the semi-formal high school dance with the young ladies from the private school who had a joint rolled in strawberry rolling papers. Yup, eight kids in sky-blue, canary-yellow and lime-green fancy outfits hanging out in the alley behind the local second-run movie theater passing around a doobie. Oh, and we got caught by a local law enforcement officer. Gee, wonder why he followed this group of well-dressed young men and women into the trash-covered, unlit, local wino hangout? Silly us. I got the “stuff,” baked the herb, melted the coconut oil and the beeswax, simmered the concoction and strained the mess into Better Than Bouillon and Smucker’s Jam jars. I did all this while alone in the house. Apparently, it was a great move on my part. My wife came home and thought she walked into a Grateful Dead concert. “What the hell is that smell?” Opened the doors, windows, plugged in fans and sprayed the whole house with very expensive essential oils. I was able to deliver the Magic Lotion to my mom that weekend. It worked. She was able to back off on her very powerful opiates and the lidocaine patches by using my Kitchen Creation. Later, we got some state-endorsed lotion, but she liked mine better. So back into the kitchen I went. It’s amazing how life comes full circle. I was able to help the woman who gave birth to me, taught me right from wrong and raised me. I was also able to say to my mom, “Hey, Ma, remember when you and dad found my concert kit?” (It was a little plastic case with rolling papers, roach clip and a little pipe.) “You know, when you ‘accidentally’ bumped into my full-length leather jacket in the back of my closet behind my hockey gear. Remember that?” Let’s just say I was not a pothead. I was a Future Medical Chemist. I present this note for your consideration. First, let me say, I am not a pot guy. Never been one. I’ve only partaken of the herb a few times at college and it never took. But, after spending a week in Denver recently, I have a newfound appreciation for the ancillary benefits of the legalization of marijuana. No, I’m not talking about helping those with chronic diseases, or boosting the economy with tax revenue. I’m now pro-pot for a much more selfish reason. I love to eat. And the city of Denver, where the pot policies are some of the United States’ most tolerant, has the best late-night food scene in the country, which is good news for a stand-up comic with sweet tooth and a late-night schedule. Blueberry-banana-coconut-mango pancakes at 2 a.m.? Done. Candied-chicken and maple-bacon pizza? I found a place. Thanksgiving burrito? Brilliant! So remember, when the pot vote comes to your town, vote with your tastebuds. (That pun was intended.) Vote yes for pot. There is no doubt that New Hampshire is a beautiful state in which to raise a family. I’m proud to bring up my daughters here and instill them with Granite State values — community, prosperity and self-reliance. As adults in New Hampshire, it is important that we are all focused on stewarding our next generation with these values, and creating public policies that support our children and give them the tools they need to succeed. Marijuana legalization and commercialization is not a policy that would promote healthy youth. By permitting commercial sales, marijuana legalization would open our state to the Big Marijuana industry, which, like Big Tobacco before, would come into our beautiful state and advertise this harmful substance to our children. Our brains are developing through our mid-20s. Using harmful substances like marijuana during critical developmental years can negatively impact brain development and lead to poor life outcomes, which can include use of substances later in life. The Granite State already has some of the highest rates of substance misuse in the country. We have an overwhelming opiate epidemic, and rank No. 1 in the nation for overdose deaths due to fentanyl. Addiction is ravaging our state. The data also shows that New Hampshire already has an exceptionally low perception of harm by our youth when it comes to marijuana use. In 2015, according to the Youth Risk Behavior Survey, just 18 percent of our high schoolers believed that people were at risk of harming themselves if they used marijuana once or twice a week. Public health researchers have long explained the relationship between “perceived risk of harm” from drug use and increased rates of use. That means that if kids don’t think a drug will harm them, they will be more likely to use it. Given the evidence for impairment during a key stage of cognitive and social development, we need to do all we can to improve our young people’s understanding of the risks associated with marijuana use. Commercializing harmful marijuana now, especially during an already overwhelming addiction epidemic, will send the message to our kids that substance use is not a big deal. As a mother, I know that I want the best for my children. As a Granite Stater, I want the best for all of New Hampshire’s children. That’s why I cannot condone the legalization and commercialization of marijuana. My feeling is that this whole legal marijuana thing is gonna create a huge headache and the only way to make it go away will be by using marijuana. All kidding aside, what I care about most are children. With legalization you will have more kids doing it and it will start at a younger age. The weed is way stronger than it used to be and the brain isn’t fully developed until age 25. Which, by the way, apparently the only ones who give a crap about that are the rental car companies. “If you’re 21, smoke all the weed you want but don’t think about renting from Hertz!” Between Netflix, video games and super weed, it will be fun to see where we are in 20 years, as long as I’m not having to take care of my kids’ kids and they’re out of my house by age 25, once the brain is fully developed they’re out! Good enough for Hertz, good enough for me! I’ve actually never tried marijuana and people don’t believe me and ask how that’s possible? I tell them because I grew up in the ’80s … and they had a commercial with an egg in a frying pan, that was all I needed to see. They spent millions and millions of dollars and they said that if they could keep one kid off of marijuana it would be worth it … I’m the kid! I could start smoking now but then it would be like all that money was for nothing. Actually, I think when I’m in my 80s I’m gonna start smoking weed … and move into my kid’s basement. The first shops legally selling recreational marijuana are now open in Massachusetts, just an easy drive from the New Hampshire border. While many have been celebrating the occasion, it’s disturbing to begin thinking that recreational pot use should be the norm. Smoking marijuana worsens respiratory symptoms and increases risk of motor vehicle crashes. Women who smoke marijuana while pregnant are more likely to have babies with lower birth weights and impaired brain development. There is a strong association between adolescent cannabis use and impairment of memory, learning and attention. Over time, we’ve been able to study and understand the effects of tobacco. We’ve been able to learn how alcohol and illicit drug use affect each person differently. We’ve been able to set limits of how much alcohol it takes to impair the average adult. We know none of this as it pertains to marijuana. Colorado legalized recreational marijuana in 2012. State police there still struggle to find a way to test for marijuana-impaired driving. No accurate method exists. That’s one of the many reasons the New Hampshire Association of Police Chiefs vehemently opposes relaxing New Hampshire’s pot laws. Think about how many people suffered from lung cancer or COPD before we changed the culture around smoking. How many people were injured or killed by a drunk driver before legally enforceable limits? In the middle of New Hampshire’s opioid epidemic, do we want to experiment with recreational marijuana use? Marijuana is currently a DEA Schedule 1 drug, which means it is still a federally controlled substance. It also means that there is limited opportunity to examine marijuana in a clinical research study. At the very least, we should push for a greater understanding of the effects of marijuana. Until then, we should abandon any notion that marijuana is “harmless” and prevent further legalization. CBD (cannabidiol) oil has become all the rage in recent months for its reputed healing abilities. Cannabidiol is one of over 50 naturally occurring compounds found in cannabis, and the oil is derived from an organic substance formed in the plant’s secretions. Marijuana and hemp both fall under the general cannabis umbrella, but cannabis does not mean marijuana. Tetrahydrocannabinol (THC) is the main psychoactive agent in cannabis and it causes the sensation of getting high. Unlike THC, CBD is non-psychoactive. This makes CBD an enticing (and legal) option for those who are looking for pain relief without the unfavorable features that are associated with marijuana — like paranoia. It boasts a variety of health benefits, ranging from improving mood disorders to treating seizures to lowering inflammation, and is available as edibles, patches, capsules, tinctures, oils, teas and vape pens. Turning 69 next month, I’ve decided it’s finally time to come out of the closet: I’m a stoner, and have been for the past 50-plus years. Like most of my generation, it started in college. I quickly discovered I liked the way marijuana made me feel, unlike alcohol, which left me dizzy, barfing, and inflamed my Crohn’s disease. While those four years are but a hazy memory, I managed to graduate, get an education and grow up a bit. Though most of my contemporaries got “serious” about life and left their dope-smoking behind after college, I never saw any reason to. I embarked on a life and career that has ultimately brought me happiness, great friendships, national recognition as a construction writer, accolades for my volunteer work, love (and later, divorce), material success far beyond any expectations, and now, in retirement, a contentment that’s beyond description. Throughout this journey, weed has been a constant. Until about five years ago, I thought of it as strictly a means of taking the edge off, relaxing the mind and body and sparking creativity. There are few things I can think of that are not more enjoyable when high (though, to be sure, some should be avoided). Now, in addition, it eases my arthritis pain, improves my sleep, and a daily tablespoon of cannabis oil has normalized my gut far more than five decades of doctors, surgeries and medications costing more than $100,000 a year. I didn’t hide my “drug use” from friends (a couple shared the vice), and never did anything I felt could make them uncomfortable. Professionally, I viewed it as a topic that, similar to religion, was best left untouched. But I was always bothered by what I perceived to be an undeserved stigma attached to pot smokers. Today that stigma is beginning to fade, as more and more people are acknowledging their membership in this “secret club.” My primary motivation in going public is to demonstrate to those who’ve known me (but not of my marijuana use) and to others that prudent recreational use of pot is in no way an obstacle to having a healthy, happy, productive life and career. Hell, it might even help! I’m not suggesting that cannabis is a universal panacea, but nor is it the images of Reefer Madness. It is, however, undoubtedly a substance with incredible potential about which we know very little. We must remove it from the Schedule 1 drug list so we can do the research necessary to find the answers. UNH Professors Karen T. Van Gundy and Michael S. Staunton took on the challenge of researching a scholarly and comprehensive book on a few of the risks, benefits, patterns and trends of marijuana use in their treatise “Marijuana: Examining the Facts,” published by the academic press of ABC-CLIO. Van Gundy offered the following summary of their findings regarding some of the most commonly voiced concerns about the drug. Most people who use “harder” drugs (e.g., cocaine, heroin) used marijuana before using those other drugs; however, the vast majority of marijuana users do not go on to misuse “harder” drugs. While marijuana use usually precedes the use of “harder” illicit drugs, simply using marijuana is not likely to “cause” the use of other illicit drugs. Instead, links between marijuana use and the use of other substances are largely due to sociological or environmental factors related to the prohibition of both types of drugs (e.g., both are bought and sold in the same black markets), and common causes (e.g., social disadvantage, childhood adversity), which increase risk for early marijuana use and other drug use. State medical marijuana laws are related to increases in the use of marijuana, but they do not appear to increase the use of other drugs. State medical marijuana laws have been linked to lower rates of opioid overdose mortality rates. Marijuana use is on the rise, but rates are not as high as they were in 1979. Nationwide, marijuana use rates have increased among adults (ages 18 to 49); conversely, marijuana use rates have decreased for youth (ages 12 to 17). The adverse health outcomes related to heavy marijuana use are generally not as severe as the adverse health outcomes associated with heavy alcohol use or heavy tobacco use. Generally, the physical health risks associated with using marijuana are less severe than those associated with the non-medical use of other illicit substances. Marijuana is safe and effective for treating pain, spasticity due to multiple sclerosis, nausea and vomiting due to chemotherapy, and weight loss in patients with debilitating diseases. As of 2016, over half of the US population favored the legalization of marijuana and more that 80 percent of Americans believed that medical marijuana should be legal. Scholarly research tends to conclude that marijuana use does not increase (other) criminal behavior, and marijuana prohibition is largely ineffective for reducing marijuana use. What It’s Like to Get High? The feelings and sensations will vary for many, but when I inhale cannabis four or five times, my blood pressure goes up a little bit and my organs begin to feel a sense of easing, lightening up, an uplifting sensation that seems to increase and rise like a subtle wave. That feeling of euphoria is the endocannabic system harmonizing, endogenously, the essential oils, THC and cannabinoids throughout our entire body, regulating our organs and orchestrating our blood cells, white and red, their DNA and enzymes and peptides within them, allowing our cells to be cleansed and nourished with the very most critical element our bodies need, endogenously harmonized cannabinoids. I feel amazing, comfortable, wanting to read, write, listen to music or become crafty and artsy. I want to listen to the sounds of nature and/or traffic and explore the lights and energies surrounding me. I feel love and compassion for others and I also feel relaxed, less anxiety about the who, what, where, when and why of life. I become acceptant and humbled. There are so many ways to describe what happens when cannabis is consumed but, for me, it’s more of a way to tune my body spiritually and physiologically so as to have a balanced well-being about myself and those that surround me. It’s about community and caring, giving and sharing. It’s a sense of the uttermost health and wellness that the holistic garden has ever provided for human beings to be healthy and happy. It’s life-giving and soul-nourishing! It’s cannabis, my friend. — by Rick Naya, who happens to be the subject of this month’s Transcript. Strict screening policies aren’t keeping up with the times. Drug-testing policies, especially for marijuana use, are no longer in step with the realities of today’s workforce. While pot is still classified as an illegal substance under federal law, state governments continue to move toward legalizing or at least decriminalizing it. In fact, Maine prohibits employers from testing for marijuana at the pre-employment stage and from discharging an employee for an initial positive drug test. In other states where marijuana is legal, testing agencies have reported a significant decline in drug testing of job applicants, especially for marijuana, even though positive results for such screens are at an all-time high. “We have just waved the white flag of surrender because of the proliferation of pot and our need to hire employees without any regard as to what they do on their own time,” one HR professional recently told me. Another sign of changing attitudes: Support in the US for marijuana legalization was at a record high of 64 percent last fall, according to a Gallup survey. Even US Labor Secretary Alexander Acosta says employers should rethink drug testing for every job applicant, Politico reported in April. Of course, such testing is still performed routinely — and appropriately — for workers in safety-sensitive positions, both before and during employment. But otherwise, pre-employment drug tests are going the way of other once-popular, but now largely obsolete, pre-hire screening methods, such as those for weight, physical agility and English language skills. Facing an aging workforce, low unemployment and a strong economy, HR professionals and hiring managers are having difficulty filling positions and are thus removing any barriers that might exclude otherwise qualified people from the workplace. In addition, many employers don’t see a return on investment when they weigh the costs of random and pre-employment testing against the results. They express concern that random screening can hurt morale, and prompt applicants and employees to look elsewhere for work. Finally, with more than 30 states legalizing marijuana use in one form or another, for all of the reasons stated above and with no scientific or legal standard to determine current impairment instead of just evidence of marijuana use at some point, more employers are dropping marijuana testing from the pre-hire screening for many positions. In short, with the relaxing of state marijuana laws, the changes in public attitudes towards marijuana use, legal challenges and labor market issues, drug testing, especially for marijuana, is declining — and over time screening for pot could go, yes, up in smoke. Queue up the Grateful Dead music — this really isn’t your parents’ workplace. Regarding marijuana legalization, NAMI NH is very concerned regarding research showing increased risk for psychosis in youth and young adults who use marijuana. Legalization will almost certainly result in commercialization and marketing directed toward youth and likely increased access for young people. On the other hand, we also recognize that some people with PTSD, anxiety and other mental health conditions report significant symptom relief from using marijuana. Although medical marijuana is available to them, many people choose not to disclose their mental health conditions to medical providers due to the discrimination and negative attitudes directed toward people with mental health conditions and subsequently choose not to have these issues become part of their health records. We will not be taking a formal position on marijuana legalization — instead, will be focusing all of our efforts on taking steps to address the mental health crisis in our state, and getting legislative support for the recommendations in the recently released 10-year mental health plan. One Sunday sitting around the kitchen table with my family, we discussed what my next career move might be. I needed something that I could do from home since I’m part of the sandwich generation — helping to raise my granddaughter and serving as full-time caregiver of my invalid mother. I also wanted something that I could do on my own with my graphic design background. After some investigation and deliberation SensiBox was born! SensiBox is a discreet, hand-curated monthly subscription box that includes “for tobacco only” accessories. The SensiBox Original, our popular themed box, contains at least seven items each month. Individual boxes cost $20 to $35 with discounts for subscribers. A lot of the SensiBox subscriptions are purchased as gifts. I enjoy putting each theme together, sourcing, designing and having items manufactured for each month. I personally don’t imbibe in smoking, but I’ve had testimonials from people who smoke for both pleasure and for medical reasons saying that SensiBox makes smoking fun and helps take away the stigma of smoking for them. Plus, there’s the excitement of unboxing the cool gear and unique accessories each month. Who doesn’t love new stuff? You can’t legally pay to advertise any smoking business on most social media platforms, but I’ve organically grown my Instagram account to over 5,000 and many of my subscribers are followers. Upcoming monthly themes include the February “Love” SensiBox with a custom, odor-resistant zipper bag and a gorgeous silver-fumed glass hand pipe. The March box is my most favorite yet, the “Magic” theme will include a custom, 9-inch-long “magic wand” pipe. The first 2 inches of the pipe are made of silver aluminum and the remaining 7 inches are black anodized aluminum. Where the two parts screw together is room for a replaceable filter. The pipe will also include a custom padded bag with a cool retro look design of a hand pulling a rabbit out of a hat, as well as a Magic 8 Ball grinder and a Book of Magic rolling papers. My kitchen-table business is doing well and growing, in spite of the current laws in New Hampshire. Hopefully, we will soon follow our surrounding neighboring states and legalize. With a motto of “Live Free or Die,” you’d think we’d be the first! — Author prefers to remain anonymous but can be reached at sensi-box.com. The offices of our newspaper, The Conway Daily Sun, are located 5 miles from the Maine border, where personal use of marijuana is legal and where by next summer retail sales likely will be available to the public. Fryeburg, Maine, is basically a bedroom community of Conway, and with all the attendant cross-border activity, we in the newsroom assumed people would be getting in trouble with either by selling or using marijuana on our side of the state line once cannabis became legal in Maine in 2016. However, except for trafficking, which almost always involves more serious drugs, marijuana has been pretty much a non-story. We suspect no one cares much about it anymore, including the police, who have better things to do than spend time hassling folks doing something that is barely illegal, now that New Hampshire has reduced a possession conviction to a violation. News opportunities are also diminished by the fact that the overuse of marijuana is very different than that of alcohol. Falling asleep on a couch watching Netflix or driving 45 in a 50-mph zone does not a headline make. Recently, the Sun acquired a popular home and garden show that is held annually in Fryeburg. It draws 5,000 visitors who come to check out 150 exhibitors during a weekend in May. This year, we added vendors selling cannabis-related products, mostly medicinal in nature. The location is also the home of the Fryeburg Fair, a weeklong agricultural expo that draws 175,000 people in early October. Not surprisingly, the father and son in charge of the fair are very conservative — in a practical, rural-Maine way, as one might expect from a family-themed operation that has been running continuously for more than 150 years. Understandably, they were quite reluctant to allow us to add cannabis to our show, but we convinced them to let us give it a try. Then he added that the doctors of a few of his contemporaries, people in their 70s, had advised them to attend the event in order to check out what the cannabis products could do for their aches and pains. It was then I realized that, here in New Hampshire, legalization is inevitable. What the Heck Is Glass? The NY Smoke and Vape Shop on Loudon Road on the Concord Heights would hardly be noticed if not for the three large American flags mounted on the clapboard storefront, but step in and prepare to be dazzled. Thousands and thousands of glittering glass sculptures, some as large as bassoons, some as tiny as piccolos, fill shelves and display cases. Fantastic shapes and even more fantastic colors abound. In the aisles, cardboard boxes are filled with more, ready to resupply the shop during the busy holiday season. One third of the space looks more technical, like a mix of a RadioShack and an apothecary. That’s the vaping section, explains store owner Virender Yadav. It’s the most quickly growing portion of his business, but he got into the work for the glass. He once controlled more than 100,000 square feet of wholesale inventory, now he just runs two stores, one here and one in Massachusetts. Glass is the generic name given to the pipes and water pipes that help smokers to inhale their combusted herbs of choice. The intricacies of some pipe designs channel the smoke and swirl it through water and ice (some have special chambers that you freeze), all to provide comfort while enjoying a long, potent pull on the pipe. Yadav is proud that many of his pipes are made by local artisans, pointing out two cases filled with tiny glass dragons and other swirling fantasies. Pipes and water pipes cost anywhere from $20 to $500. What makes mere glass so costly? Yadav explains, “You have iron ore that becomes cast iron — that becomes steel that becomes stainless steel that becomes British steel. You can do the same with glass.” Each of these thousands of pipes is different, like snowflakes, he says, and each the product of someone’s handcrafting. Asked if he has a preference, he holds his fingers to his mouth and shakes his head. “Never have I smoked a single puff,” he says.